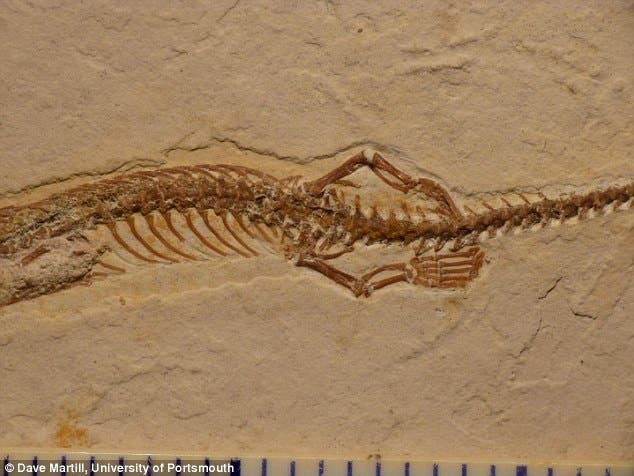 An “absolutely exquisite” fossil of a juvenile snake with limbs has been discovered by paleontologists, forgotten in a museum. The fossil dates back from the early Cretaceous, 110 million years ago, and is the oldest evidence of a definitive snake. Snakes are elongated, legless, carnivorous reptiles that evolved in the late Cretaceous; the earliest evidence (before this) of a snake was 94 million years old, but the fossil record of snakes is relatively poor because snake skeletons are typically small and fragile making fossilization uncommon. Based on comparative anatomy, there is consensus that snakes descended from lizards, and these legged snakes further strengthen this theory. Dr Dave Martill from the University of Portsmouth who conducted the study, says this fossil can show how and why snakes lost their limbs. The first observation that they made is that the limbs show adaptation for burrowing, not swimming, which indicates that snakes evolved on land, not in water, as was proposed by some scientists. 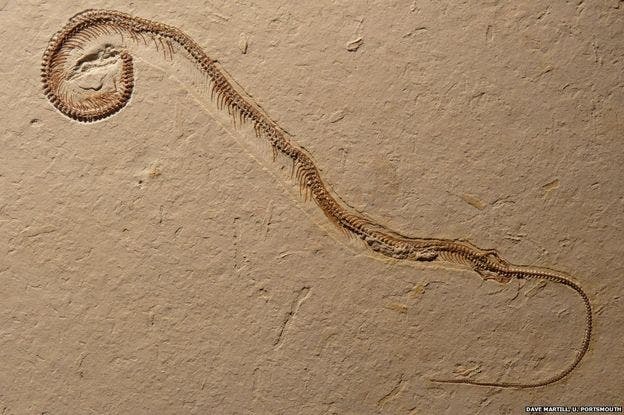 “This is the most primitive fossil snake known, and it’s pretty clearly not aquatic,” said Dr Nick Longrich from the University of Bath, one of the study’s authors. Researchers were actually surprised by how clear the features of the fossil are – they were expecting something more ambiguous, more “in between”. Instead, he saw “a lot of very advanced snake features” including its hooked teeth, flexible jaw and spine – and even snake-like scales. Furthermore, the fossil also reveals that the ancient snake had ingested a vertebrate – a clearly snake behaviour. The snake, named Tetrapodophis amplectus by the team, measured just 20 cm from head to tail, though it likely grew much bigger than that in adulthood. The head was about the size of a fingernail and the limbs were actually very little, but still useful. The fossil had a history as strange as the snake itself. It was simply acquired by a private collector, where it languished for decades before a museum in Solnhofen, Germany, acquired and exhibited it with the label “unknown fossil”. It was actually when Dr David Martill, another of the paper’s authors, took his students out for a field trip that the fossil was rediscovered and properly appreciated.